Hinchliffe Holmes are delighted to offer for sale this well presented four bedroom detached family home situated in a popular cul-de-sac location. 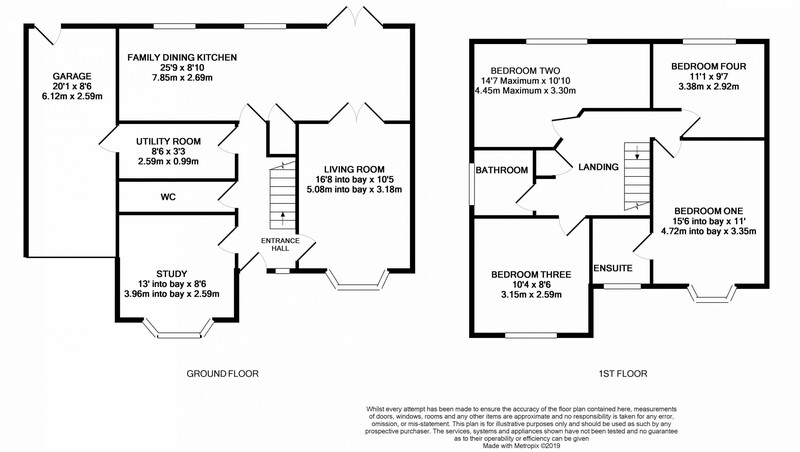 The accommodation briefly comprises; Entrance Hall, Living Room, Family Dining Kitchen, Study, Downstairs W.C. Utility Room, Integral Garage and to the first floor, Master Bedroom with En-Suite, a further Three Bedrooms and Bathroom. Viewing is highly recommended. From the Bull Ring in Northwich, head west on Apple Market Street towards Weaver Way. After approximately 0.4 miles turn left onto Leicester Street and continue to the roundabout, taking the second exit onto Venebles Road. After approximately 0.3 miles turn right onto Chester Way/A599 and after approximately 0.3 miles turn left onto London Road/A553. After approximately 0.8 miles at the roundabout take the second exit onto Kingsmead/A533 and continue to the next roundabout and take the second exit, remaining on Kingsmead/A533. After approximately 0.3 miles turn right onto London Road, and at the roundabout take the first exit onto the A556. After approximately 3.9 miles, turn right onto Sandington Drive, turn left and then left again onto Foxhill Close. UPVC double glazed bay window to front, fitted carpet, double doors into Open Plan Dining Kitchen Area, radiator, gas fire with marble surround and hearth, coving to ceiling. UPVC double glazed bay window to front, radiator, fitted carpet, coving to ceiling. Tiled floor, fitted with a range of matching wall and base units comprising cupboards and drawers, base units with Quartz work surfaces over and tiled splashback, one and a quarter sink unit with engraved drainer and chrome Swan style mixer tap, UPVC double glazed windows to rear, radiator, fitted Neff dishwasher, fitted 4 ring halogen Neff hob with extractor fan over, Neff double oven, inset downlighters, understairs storage. Tiled flooring, space for washing machine, space for undercounter freezer, space for undercounter fridge or washing machine, granite work tops with Belfast style sink with Swan style mixer tap and engraved drainer, inset downlighters. Wooden flooring, low level WC with push flush and hidden cistern, marble shelf, rectangular wash hand basin with mixer tap and storage below, splashback tiling, extractor fan and radiator. Airing cupboard, coving to ceiling. Corner shower with glass sliding door and chrome attachments, low level WC with push flush, heated chrome towel rail, wash hand basin, fully tiled walls, inset downlighters, extractor fan and UPVC double glazed opaque window to front. UPVC double glazed window to rear, fitted carpet, radiator, loft access. UPVC double glazed window to front, radiator, built-in wardrobe and fitted carpet. UPVC double glazed window to rear, fitted carpet, built-in wardrobes, radiator. UPVC double glazed opaque window to side, low level WC with push flush, wash hand basin with chrome mixer tap, bath with glass screen and chrome attachments over, fully tiled walls, inset downlighters, extractor fan. To the front there is a garden mostly laid to lawn with established flower beds and shrubs with a block paved driveway and an Indian sandstone path to front door. To the rear the garden is mostly laid to lawn with well-established flower beds and plants. There is an Indian sandstone style patio ideal for outside entertainment and side access to the front of the property. There is a wooden storage shed and outside tap. Up and over door, UPVC double glazed door to rear, power and light, loft storage.